I’m in the middle of a few courses on edX right now, and I felt like sharing my experiences so far, and other thoughts I was having on the uses and applications of MOOCs. A MOOC, or massive online open course, is a general concept. It’s usually attributed to any course that’s available to a large audience via the Internet, with a very low barrier to entrance (i.e. free, and only requiring a simple user registration). Such courses have been around for a number of years, but the landscape is constantly changing, growing and being redefined. Think of the college you attended. It’s just like that. Except the classroom is your table, couch or bed, and you can show up in your underwear. You’ve got thousands (or tens of thousands) of classmates from all over the world, sharing in classes from a hundred different colleges (including the likes of Stanford, Harvard and MIT, as well as starters and online schools like School Yourself), and they’re offered for free. You can jump in late if you think you can catch up, and drop out early if life happens or you realize the course is not for you. No penalties. No tuition reimbursements. Some have start and end dates and deadlines, with moderated discussion boards, while others are open all year to anyone (or any group of people) wanting to move at their own pace. Some universities, such as MIT, host their own MOOCs (although they also use edX). But more recently (in the last few years), the trend is shifting towards sites like edX, Coursera and Udacity providing a central platform from which to host course material, such as lectures and videos, assignments and quizzes. Additionally, they provide extra features like forums and wikis for collaboration, and they reduce the number of places you have to go to search for courses. Exposure. Universities and exclusively-online schools are exposed to a world-wide audience, who may not have otherwise heard of them. Notoriety. Professors are also exposed to a world-wide audience. If you love teaching others, then surely the prospect of reaching tens or hundreds of thousands of people is exciting, and they’re willing to expend a great deal of time setting up these courses (sometimes by themselves, sometimes with other professors or a staff), in order to be on the frontier of a new form of education. Pro: We get access to material from top-notch individuals all over the world. How about an introductory course on Aerospace Engineering taught by a former NASA astronaut? A course on the latest immune system research, put together by 5 PhD’s? Courses from Microsoft on C#, TypeScript, Azure, Bootstrap and more? Pro: Try out anything that looks remotely interesting. You can sign up for more courses than you could possibly take, even if their schedules overlap each other. Try one out for a couple weeks and see if you like it. When the next one starts, you can take both, or you can unenroll from one or the other if it’s just too much. Pro: You don’t have to stick with anything you don’t want. I started a course on digital circuits that looked interesting, but after a half-hour of watching videos it became obvious the professor was just reading a lecture. Unenrolled, done. Con: You don’t get actual credit for the course, and the fact that you took them doesn’t mean much to anyone but you. However, I ran across some information indicating certain colleges are applying courses towards credit, for a fee. Also, Coursera has started developing “specializations“, grouping courses with a focus in one particular area and wrapping them up with a project to apply your new skills. Likewise, edX has its Verified Certificates, where they confirm your identity in order to validate you finished the course, and XSeries Certificates, which are tracks of related courses combined with Verified Certificates. Both of these have fees, and it’s one way they’ve started to monetize. Pro/Con: You have to learn to be disciplined all over again. For many of us, it’s been years since we were in a school setting, with lectures and assignments. And now there’s no parents to check in on you. There’s no financial pressure of losing money if you fail the course. There’s no transcript of courses to be embarrassed about if you fail them. This could be good or bad depending on your point of view! It truly is all about what you want to put into it and get out of it. Although the major sites provide forums for some collaboration and support, it’s not the same as working with a group of people. I wrote a little about MOOCs before, the first time I tried one last Fall. I was attempting a course with a group from the Akron Code Club (join us in Fairlawn, on the second Monday of the month), but it fizzled out relatively soon, unfortunately. 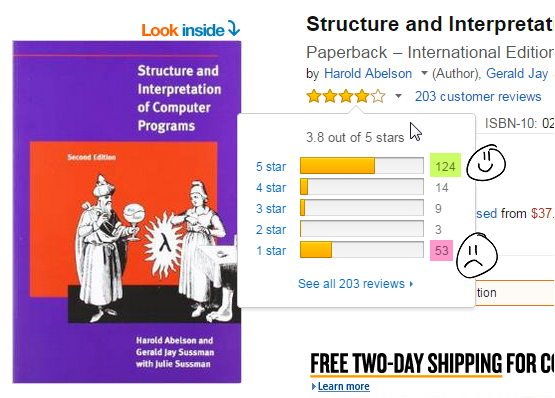 We tried taking another course together more recently, MIT’s SICP. We made it a little further this time, but life happens, people started dropping (myself included), and it too fizzled. Huge thanks to Jerry D’Antonio, who did a phenomenal job of organizing the course using Github’s Issues. We had a mission statement to keep us focused, an assignment schedule, and face-to-face meetups every other week. If you’re going to work in a group, I think you need that one person who’s going to take the helm, and Jerry did that for us. Check out our schedule if you’re looking for ideas. I can’t speak for everyone else, although I think bad weather and scheduling conflicts (i.e. “life”) played a large part for everyone. For me personally, I didn’t find the material interesting or applicable to anything I was doing IRL. I really only wanted to do it for the experience of studying in a group. OTOH, a lot of people have taken it, being that it was basically MIT’s “Intro to Computer Science” course for the last 30 years, so I may give it another go in the future. Ratings on Amazon show just how polarizing the course is. Github. We could upload and share our code, as well as post announcements and track conversations (via “Issues”). Panera’s. Anywhere with wifi would do, but Panera’s had a back room we could use. There was a minimum purchase fee (like $50), but it was easily met with the number of people we had. Pairing or smaller groups. Meet as a large group for 15 minutes to get everyone on the same page (similar to a stand-up in programming), then split into groups of 2-4 people. I think that’d give everyone a chance to talk, and provide for more discussions. Perhaps even have a smaller group overall, or at least focus on a subject that the group feels more passionate about. Hopefully, I’ll get to try another course as a group again… maybe take a crack at organizing one sometime. The online forums are not real-time, and it’s not the same as meeting with people face-to-face. Not every course needs to be a group one, but I think the right course, under the right set of circumstances, could be beneficial. Finding a course isn’t much of a challenge, but finding a course that interests you can be. Use the search function built-in to the big sites, like edX and Coursera. Find related courses by searching edX XSeries and Coursera Specializations. Although you can pay a fee for each course, in order to verify your identity and earn a certificate at the end, you don’t have to. Instead, use these areas to find related courses, and then register for each of them individually like you would any other course. Register for more than you can take, to find out what the course is actually like. Enrolling and unenrolling is easy. If you see multiple courses that interest you, and they start around the same time, but you aren’t sure which is better, just register for them all and after a week or two you can unenroll from some. Read the ratings, when available. 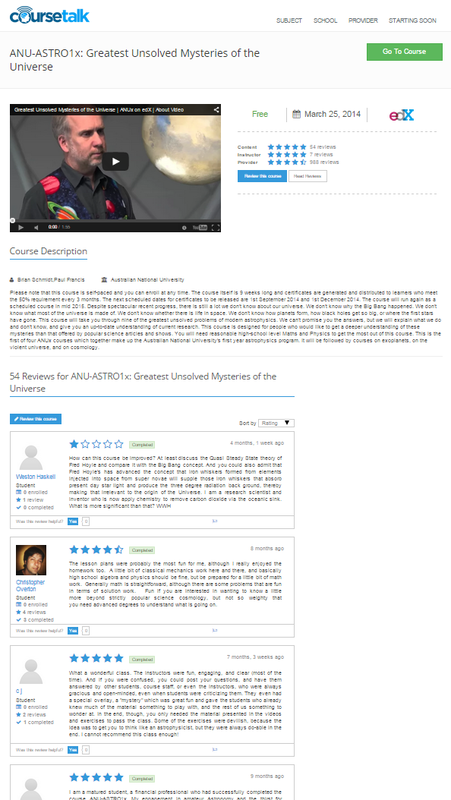 An Australian National University course on the mysteries of the universe, for example, has very high ratings on edX. There’s a link you can click on the right-hand side, under the reviews, that takes you to a more detailed page, which shows 54 reviews on the content, 7 reviews on the instructor, and nearly 1000 reviews on the university itself, all very high. They even tag individual reviews with a “completed” tag. The Computing Technology Inside Your Smartphone, taught by Dave Albonesi, a professor at Cornell. I also signed up for the course taught by an astronaut that I mentioned earlier. I ended up dropping it (and a couple others) because I couldn’t dedicate enough time with these other courses, but the teacher was engaging. That’s actually becoming an issue for me. There’s only enough time in the day, but there are so many interesting looking courses. I wish I could take more at once, but these three are enough for now. Are there other applications for MOOCs? We home school our kids, but home schooling doesn’t mean we do everything for them. Especially as they get older and start learning more difficult subjects, we’ll look for the right resources. That may mean finding a group of people and sharing time and talents, some parents watching the young kids, while other parents with backgrounds in education teach certain courses. Or purchasing a curriculum, that comes with text books and instructor material. Or hiring a tutor to teach a particular subject. MOOCs hold a lot of promise in this arena, I think. That’s why I’m taking the Algebra and Geometry intro courses from School Yourself. In addition to (depressingly) realizing how much I’ve forgotten over the years, I’m also experimenting to see if it’s something that could supplement the kids’ work. In fact, when people introduced themselves in the forums at the beginning of the courses, there seemed to be a number of kids. I’m not sure why they’re taking them, but it’s promising. School Yourself in particular has created some really interactive courses, with short lessons that take about a half hour or so apiece, so they’d be perfect for supplementing other math instruction. I may write more about them later… I’m only half-way through right now. One’s about 12 weeks, the other 14. There are other sites that cover MOOCs in detail, and follow the latest trends, if you’re interested. edX has a half-hour demo course to get you started using their service. The others probably do too, if you look around.